Hi everyone, I hope life is treating you well. If you have read any of my posts before you will know that I like to talk about nature a lot 👩🏻‍🌾. There are huge benefits to allowing nature into your home and your life. It is tough through the colder months to get your ecotherapy fix and truly benefit from the power of nature. Throughout the colder months we tend to hide ourselves away from the outdoors and by the time spring comes we are like excited little lambs seeking sunshine and country walks. Whatever time of year it is, there are ways of bringing nature into your home. Adding a touch of the great outdoors to your home can encourage a calmer atmosphere and keep you connected to nature. Dont wait for the love of your life to bring you flowers. Yes its lovely to receive flowers but failing that you can buy them yourself, for your home. You can buy fresh flowers all over, local florists, stalls in lay-bys on you daily commute and local supermarkets often have a great range. I often buy flowers for our dinner table. I don’t spend a lot, I just add a cheap and friendly bunch to my trolley. Usually choosing whatever jumps out at me depending on what mood I’m in. What I spend on flowers I could spend on a cake, both equally delightful, except one is better for my health ! When I have put my shopping away, I look forward to putting my flowers in a little vase in the centre of the table. I find it lifts my mood and makes me smile whenever I look at them. A cheap and easy way to add a touch of nature into your home. I absolutely love candles ! I always have a few on the go. When evening comes and it’s time to unwind, there is just something incredibly relaxing about lighting the candles and watching the flames dance. As well as being a very mindful practice it is also a way of telling your mind it’s time to chill. Something as subtle as lighting a nature scented candle of your choice will help you feel the calming effects of nature, thus letting nature into your home. Just lately I have noticed a lot of the high street shops, selling products with a nature based theme. There really is something for everyone’s taste and budget on offer. Cushions, throws and bedding with nature themes, can help add a relaxing feel to your room. Wall hangings and plaques with nature based quotations on them, give you pause for thought and add a touch of mindfulness to your home. For those of you who are really keen, there are teapots, cups, plate sets, tea towels ….. you name it! It all depends on your taste really, but the option is there. Adding items to your home which have a nature based vibe will lift your spirits each time you look at them. They will help you get a sense of the outdoors right inside your home. The colour green epitomises nature itself. The grass, the leaves, forests, trees and plants all are heavily saturated with one shade of green or another. Wherever you see all the other beautiful colours of the rainbow that grow in our gardens and parks, you will see green in and amongst. Being in the centre of the spectrum, it is the colour of balance – a more important concept than many people realise. So if you are wanting to invite a feeling of nature into your home then green is the way to go. Maybe a green feature wall ? Pictures or canvases with green images. Or how about giving yourself a little corner of the room where you can create yourself a zen den. Filled with green floor cushions and a green focal point. Green, which is Nature’s colour, is restful, soothing, cheerful, and health-giving. Last but not least, one of the easiest ways of bringing nature into the home is by caring for a house plant. Now I know many people avoid having a house plant as they insist that no matter what they do, they always manage to kill it ! The easiest answer to that is……….don’t choose a plant that is difficult to care for. Some houseplants have their own little rule book. Dont do this, don’t do that, must be at a certain room temperature, not too much light, not too dark. Don’t over feed, must face a northeast direction 😁😁 etc, etc. Complicated right? Not everyone has time for maintaining that kind of upkeep, those types of plants are best left to the experts. So don’t rule yourself out just yet, you are more than capable of looking after a plant. You just need something easy to care for. There are tons of easy to care for houseplants, such as the Aloe plant and Money plant. There is a great list here which names just a few. The benefits to keeping plants are that, they obviously bring nature into your home. Above that, they also give you a sense of purpose. As you care for the plant and watch it grow over time, you will have contributed to its health. The plant will become a part of your home. It is a very mindful excersise to take part in and can also be a great way to get the kids involved. Caring for a houseplant offers a sense of responsibility. It gives them something to look after and care for, connecting them with nature. 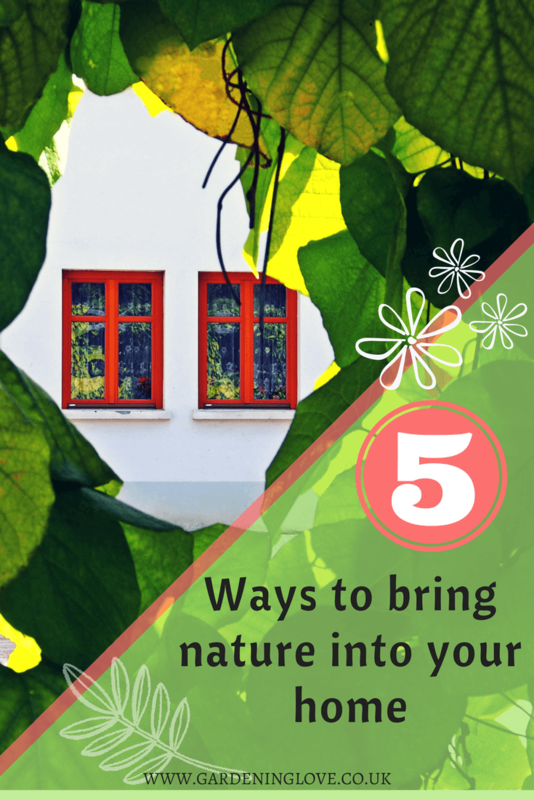 So there you have it folks… 5 ways to bring nature into your home. I hope you find these ideas useful and that they spark a little bit of creativity for you. 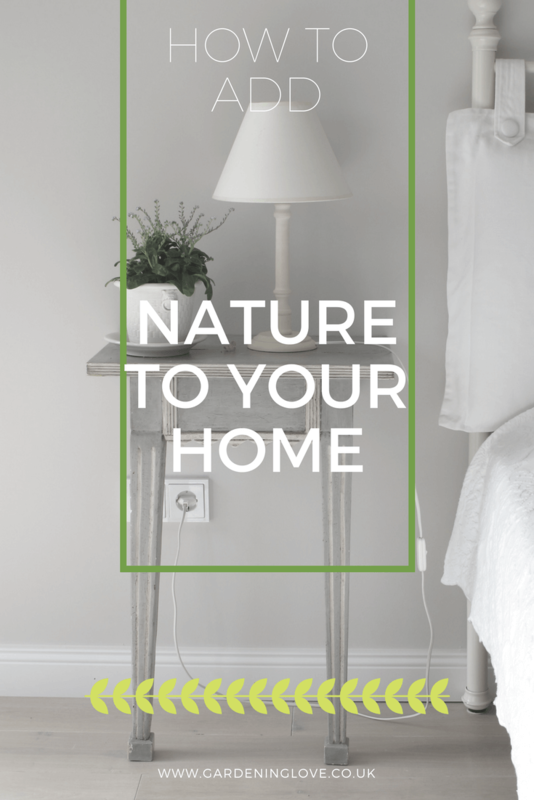 How do you bring nature into your home? Do you find having elements of nature around the home creates a calming atmosphere. Please share any thoughts below.